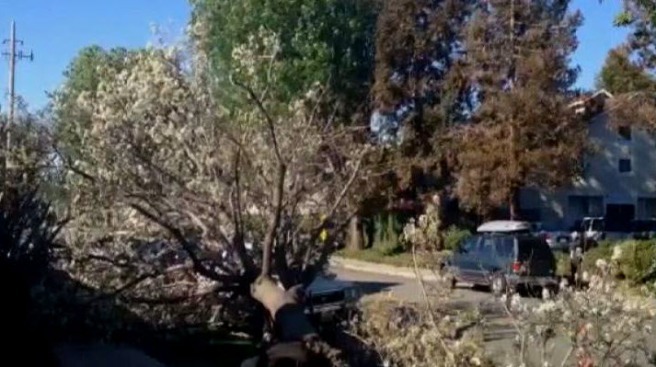 High winds are expected in much of the Bay Area Tuesday night, with gusts of up to 50 mph possible in some areas, according to the National Weather Service. A wind advisory has been issued for Tuesday night, and forecasters predict that strong winds will start around 8 p.m. in areas including the interior valleys and hills of the North Bay, the San Francisco Bay shoreline, the San Francisco Peninsula coastline and the East Bay interior valleys and hills, according to meteorologist Larry Smith. "You could see winds increasing to 20 to 30 mph, with gusts of up to 45 mph below 1,000 feet," Smith said. "Above 1,000 feet, gusts of up to 50 mph are possible." Downed trees and power lines are possible, and driving could be difficult in some areas for large vehicles, Smith said. The winds should ease up Wednesday morning after around 8 a.m., Smith said.